The Laurier library has students’ backs. That’s truer than ever now thanks to a project jointed funded by the Library and a generous Student Life Levy grant to upgrade its Waterloo campus individual study rooms with ultra-comfortable, ergonomic chairs. The study rooms can be easily booked online up to one week in advance by students registered with the Accessible Learning Centre or PhD candidates actively engaged in research. The library has now procured the chairs for each of the 13 individual study rooms in the Waterloo campus Library building. The rooms are spread between floors three to seven of the building and can be booked at the main desk in addition to online. (The online booking system uses a privacy enhancing feature). In addition to the new chairs, the various individual study rooms include features such as power bars, headphones, workstations and lockable doors. 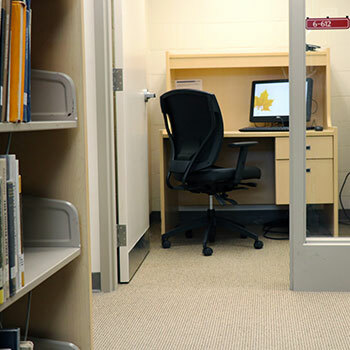 For more information about the features of each of the rooms, visit the individual study room page on the library’s website.